Tempt your taste buds with your first stop at Roots 657, a café and local market located at the corner of Route 657 and Route 15 just south of the village of Lucketts. Enjoy a Chef Tasting with small bites of Chef Rich Rosendale’s specialties. Peruse the market, filled with candles, pottery, soaps, condiments, foods, wine, and beer, a selection curated from Chef Rosendale’s local and world travels. Next, take a short drive to Fabbioli Cellars for small bites with wine pairings as you enjoy the view from the tasting room, overlooking the 25 acres of vines. Be greeted by the aroma of freshly baked baguettes when you enter the tasting room and be delighted by the tree in the center of the building, with crystals dripping from its branches. After sampling some of Fabbioli’s fine wines, visit their wine shop on the main floor to browse their wide selection of fine wines. You’ll even find a few named after their beloved cat. Vanish Brewery isn’t just known for their beers. When you approach the 53-acre Black Hops Farm in Lucketts, VA, you’ll be welcomed by the mouthwatering scent of smoked barbeque and wood-fired pizza. Sip some of their more than 20 beers on tap while you enjoy scenic views from their outdoor seating, or chat with the bartender in the taproom. Finish the evening with a meal you can experience at Cookology, the recreational culinary school where guests learn to prepare their own gourmet meal with the help of Cookology’s professional staff. Loudoun has a rich history rooted in a tradition of agriculture. Visit the Loudoun Farm Heritage Museum to travel through Loudoun’s past and consider its future as D.C.’s Wine Country grows and evolves. Learn about Loudoun’s first inhabitants as you study Native American artifacts, interact with the Tic-Tack Horse Shack exhibit to learn about Loudoun’s vibrant equestrian history, and explore their many interactive exhibits that showcase how agriculture has grown in Loudoun as you learn where your food came from. Solace Brewing Company is one of Loudoun’s newest (and largest) breweries. Sip cold beers on tap and take a peek into the brewing process through the floor-to-ceiling windows looking into the production room. Also, try their Nitro Cold Brew Iced Coffee or Flavored Sparkling Water on tap! Sit back and Find Your Solace. The Conche turns indulgence into an art form. Enjoy lunch at this trendy chocolate-themed restaurant, with a menu crafted by renowned Chef Santosh Tiptur. Take a peek into the Chocolate Lab where beautiful truffles and bonbons and decadent desserts are crafted daily. Finish the experience with a dessert activity. At Stone Tower Winery, guests can enjoy beautiful views of Hogback Mountain from the Harvest Barn or Tower View Tasting Room while they savor wines made from the 80 acres, and growing, of vineyards on the property. To top off the day, kick up your feet and relax for dinner. The experience will be brought right to your table with dinner at Out of the Blue Seafood. You will feel like the boat just pulled in with how fresh the seafood is arriving at your table. They hand select their crabs, including their enormous colossal blue crabs, by the former commercial fisherman and owner. They even have a custom designed steaming system so your fresh catch is cooked with tender care. Explore the historic town of Occoquan by enjoying delicious food and beverage! Begin your tour by receiving a warm welcome from the Mayor, Earnie Porta. Discover over 300 years of history in a guided driving tour of the quaint riverside town as he highlights the past and unique details of Occoquan. Uncover stories of the historic buildings and how the town got its name. Take a seat with a glass of wine and an appetizer from The Bottle Shop. The menu is the perfect balance of casual and fancy with appetizers ranging from Parmesan-Asiago Dip to Bacon-Wrapped Dates. After your meal, take home a bottle from their vast selection of wines and craft beer from all around the world. Next is lunch and a view at Madigan’s Waterfront. While gazing at the dazzling Occoquan River, savor a meal of mini crab cakes, chicken salad-filled pastry cup, & Tilapia Bruschetta; a dish served over seasoned flatbread topped with basil, fresh tomatoes, parmesan cheese, and a balsamic glaze. During your main course, So Olive will give you a taste of, and educate you about, their wide variety of olive oils, such as their Persian Lime Olive Oil. After your entrée course, stroll through the individual shops around Occoquan and take a piece of the history home with you. All aboard Miss Rivershore for a water-route tour on the river. As your journey progresses, the captain will provide narration on the real estate, history, wildlife, and boats along the way. Your course will come to a sweet end with a slice of Mom’s Apple Pie. You can chose from one of their many flavors, including the Bourbon Walnut and Virginia Blackberry pie. After a busy day of tasting delightful food and enjoying the spectacular views of the Occoquan River, you will travel to Rippon Lodge for a historic happy hour. Built in 1747, Rippon Lodge is the oldest home in Prince William County. It doesn’t get more authentic then touring a home from Colonial Virginia while tasting beer made from all natural ingredients. The history will continue with dinner at The Harbour Grille, settled along the Occoquan River. While enjoying the view of the marina, sample from menu items such as the Angus Ribeye Steak or Grilled Atlantic Salmon with Crispy Parmesan Polenta. Nothing like enjoying surf and turf along the water to top off a perfect day! Manassas was an especially important spot during one of America’s most influential moments: the Civil War. You will begin your day at Ben Lomond Historic Site, a hospital used during the First Battle of Manassas. As you explore the home, a tour guide will provide narration on what it was like to be a patient in 1861. You will be fully immersed in the experience as you will hear, smell, feel, and even taste the history. One of the oldest ways to make food, an open-hearth cooking demonstration, will also be on-site. Following Ben Lomond, you will take part in an architectural driving tour of Downtown Manassas. Emphasizing the unique architecture present throughout, the tour also speaks on the people throughout time who made Manassas what it is today. The big stop of the tour is The Candy Factory, which made and distributed up to 10 tons of candy daily throughout the region in the early 1900’s. Currently housing The Center for the Arts, The Candy Factory is abundant with cultural expression; people of all ages come here to perform through dance, drama, or visual arts. You will work up an appetite exploring the city. Your next food stop will take place at 2 Silos Brewing Company. The newest destination brewery in the region, this expansive property repurposed a historic barn with two silos attached (get it?!) which are the focal point of this impressive brewery and live music venue. 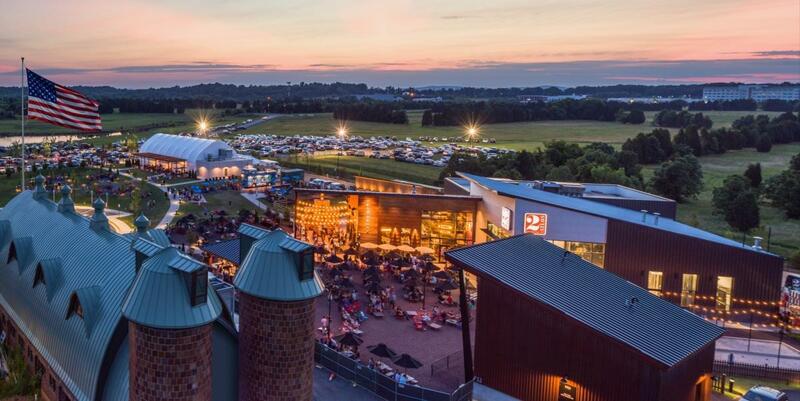 Between the 10,000 square foot beer garden, bocce courts, multiple bars, and an impressive farm-to-table inspired menu, you may not want to leave! Finish out your culinary adventure with a knockout tour at MurLarkey Distilled Spirits. If there are two things the team at MurLarkey knows, it is spirits and quality customer experiences. Unaged and aged distilled spirits are made, stored, bottled, and shipped right on site. Walk around the plant for an in-depth tour on the production process of spirits, and have a tasting too!